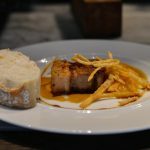 Pincho or pintxo, as it is known in Basque, is a little piece of heaven on a plate. Well.. at least in my book! This small snack from the north of Spain can come in different forms and some of its variations can be very elaborate in terms of flavours and textures. Often a toothpick or a skewer is used to spike all the ingredients to a piece of bread, which could explain the name pincho – literally a spike. 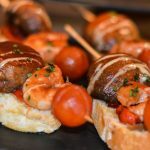 Although I had a chance to try pinchos in Barcelona, tasting this speciality in the Basque Country was unbeatable. I was spoiled for choice most of the times and it was very hard to decide on my snacking selection. 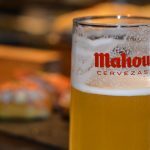 When visiting Bilbao I was lucky to hang out with Jess, my bubbly friend that I met in Valencia, as she knew the city and its best pincho bars like the back of her hand. She also introduced me to Txakoli, a very light white wine popular in this part of the country. Café Iruña, established in 1903, was probably one of the most traditional places that we visited during my stay in Bilbao. Eating tasty pinchos in the surroundings with impressive tiles and paintings. Truly a bliss. Las Cepas might be a small and modern place but it has a huge selection of pinchos. Smoked salmon? Goat cheese or maybe blue cheese? If you end up nursing a headache the next day maybe it was down to all these tough decisions rather than that Basque cider? La Roca is a slightly more expensive bar that serves gourmet dishes and pinchos with a twist. I had a chance to try two of their specials. 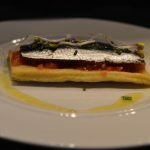 They first served me a marinated anchovy with citrus and radish sprouts on a piece of crisp bread, followed by Iberian bacon roasted at a low temperature with sweet potato cream. The service was superb!